Happy New Year to all of my lovely bloggers/followers!!! The blouse I bought it at one of our favourite stores, value-village thrift store. It's a vintage top, it even had the shoulder pads that I so dislike, but I loved the colour and thought it had potential! When I got home, I took off the shoulder pads and really liked how it looked, so I decided that's what I would wear. 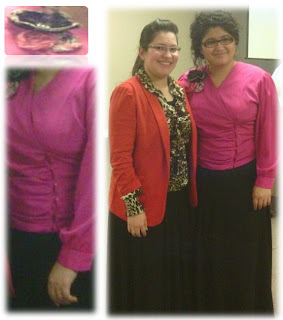 Also, I love what my friend Julieth was wearing, she got her printed top at Winners. She looked lovely. P.S. Are you following me at my new blog yet? The Songs of Our Life here!